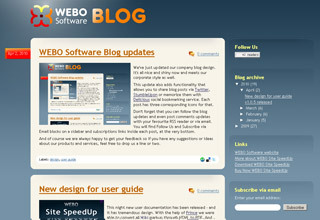 We've just updated our company blog design. It's all nice and shiny now and meets our corporate style as well. This update also adds functionality that allows you to share blog posts via Twitter, StumbleUpon or memorize them with Delicious social bookmarking service. Each post has three corresponding icons for that. Don't forget that you can follow the blog updates and even post comments updates with your favourite RSS reader or via email. You will find Follow Us and Subscribe via Email blocks on a sidebar and subscriptions links inside each post, at the very bottom. And of course we are always happy to get your feedback so if you have any suggestions or ideas about our products and services, feel free to drop us a line or two.